An oatmeal recipe needs to be a staple when you're managing your weight. And this one happens to be perfect. Oats are one of the best low glycemic grains to eat to lose fat! They are so high in fiber that they seem to expand when you eat them and fill you up for hours. They don't raise your blood sugar either which is essential to prevent fat storage. If you are sensitive to gluten it's possible to get gluten free oats with the Bob's Red Mill brand of rolled oats which cook and taste the same as any regular oats. All oats, including Quaker Oats are low glycemic. We happen to be gluten sensitive in my family so I was happy to find these. 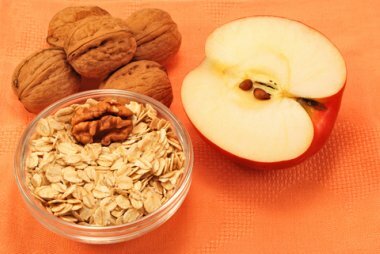 Oatmeal is a very healthy breakfast recipe, filling and nutritious, especially when you add the apple and walnuts. Then you have a biochemically perfect breakfast for the low glycemic plan. You're getting protein in the walnuts and milk, low glycemic, whole grain carbohydrates with the oats and omega 3 fats in the walnuts! Bring water to a boil and stir in the oats. Reduce heat to a simmer and put on a lid leaving a little space so it doesn't boil over. Simmer for 10 minutes and turn the heat off. Add the grated apple, chopped walnuts, dried cranberries, agave syrup and stir. It's ready to eat with 1/2 cup unsweetened plain almond milk or low fat cow's milk if you prefer. There's no difference nutritionally between regular and quick oats other than the size of the flake. However, I prefer the coarser texture of the regular sized flakes and find that the 10 minutes it takes to cook it is enough time to make a cup of tea and find a bowl. If you like it creamier than you'll probably like the quick oats. If you put the oats in first and then bring to a boil you'll also get a creamier oatmeal. Oats are beneficial to your health in many ways including that they contain a cholesterol lowering fiber called beta glucan. By consuming just one bowl of oatmeal you are getting 3 grams of this fiber which lowers your cholesterol by up to 23%. Studies have shown that eating 20 grams of fiber every day can produce up to a 15% drop in cardiovascular disease. According to a 20 year long Physicians' Health Study, participants who ate one bowl of whole grain cereal a day showed a 29% lower risk of heart failure! As far as the weight management aspect of eating oatmeal, there's more good news. The beta glucan fiber helps to stabilize blood sugar and improves insulin sensitivity by lowering glycemic content. When you add the walnuts and apple you are getting protein, omega 3 fatty acids and more phytonutrients. Oatmeal is not only filling and nutritious but it's one of the best breakfasts you could choose to keep your blood sugar even. When you have perfectly balanced your blood sugar you're going to feel sustained energy until lunch time. You can really feel the difference when your blood sugar is even throughout the day because you are eating low glycemic foods. No more food cravings! This super nutritious recipe makes for a low glycemic, healthy breakfast recipe that supports sensible weight management. Return from Oatmeal Recipe to Low Glycemic Recipes. Return from Oatmeal Recipe to Lifetime Fat Loss home page.